Yesterday was so surprisingly (and delightfully) sunny and warm out, I felt inspired to bake something appropriately upbeat. I love the pink lemonade cake at Dewey’s (a yummy Moravian Winston-Salem bakery), and felt inspired to try a version in my kitchen. After all, what’s more warm weather appropriate than pink lemonade, really? 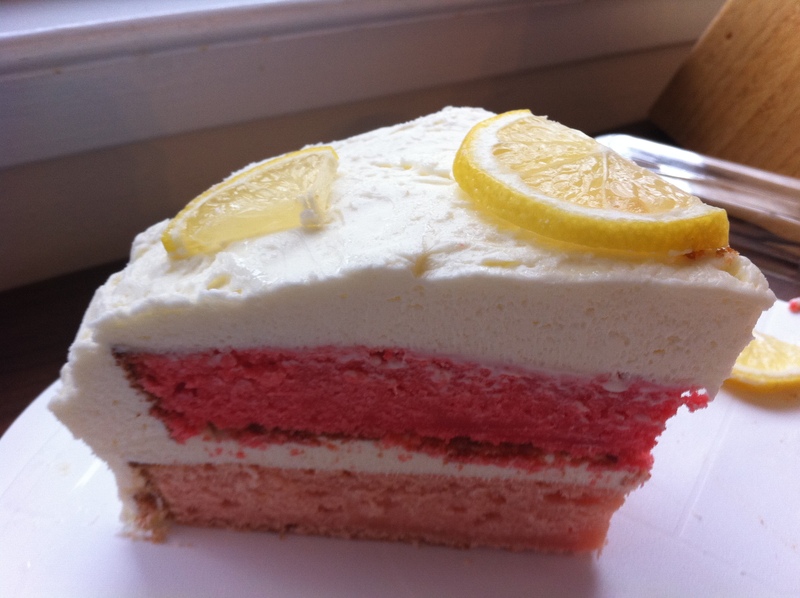 I’d added this Better Homes and Gardens pink lemonade cake recipe to one of my Pinterest boards not too long ago, so I gathered all the ingredients and gave it a try yesterday. I will say, my outcome yesterday was good but not great. The recipe called for the cake to bake for 35 minutes, but when I checked mine at 30 minutes it was already a little more done than I’d hoped for. Next time I’ll definitely cut down on the baking time! Still, I think this cake has definite potential and I’ll be trying it again for sure. In medium bowl stir together flour, baking powder, and salt and set aside. In a mixing bowl, beat butter with mixer on medium speed for 30 seconds. Gradually add sugar, about 1/4 cup at a time, beating on medium until well combined. Scrape sides of bowl and beat 2 minutes more. In another medium bowl, stir together milk, lemonade concentrate, and lemon extract (mixture will look curdled). Alternately add flour mixture and milk mixture to butter mixture, beating on low after each addition just until combined. Remove half (about 3 cups) of the batter and spread in one pan. In the remaining batter, mix in an additional 1/4 teaspoon red food coloring. Spread in second pan. Bake about 25-30 minutes (watch it carefully so you don’t over-bake it like I did! ), until a toothpick comes out clean and tops springs back when lightly touched. Cool in pan on wire rack for 5 minutes, then remove from pan and cool completely on wire rack. In a mixing bowl, beat softened butter on medium speed until light and fluffy (about 30 seconds). Add marshmallow creme and lemonade concentrate. Beat until smooth, scraping sides of bowl. Add powdered sugar and lemon extract and beat until light and fluffy. Ice the cake and garnish with sliced lemons, if desired. 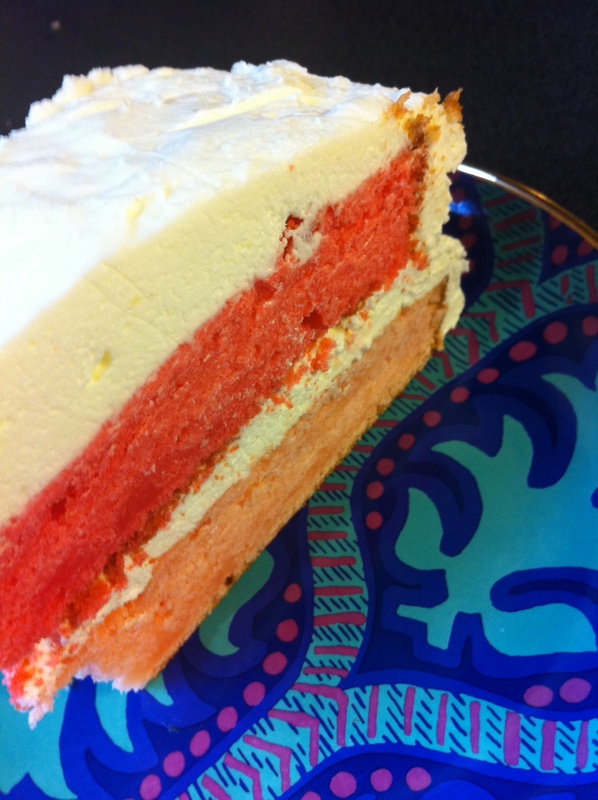 The Better Homes and Gardens recipe maker was more ambitious than I was, because they recommended cutting each cake layer in half and then alternating the resulting four layers between light and dark pink. I was not quite as brave, and was worried that if I attempted to cut the layers (which were pretty thin) in half, I might end up without a cake at all. So I stuck with two layers, which still looked fun with the two shades of pink! Was anyone else inspired to do something springlike yesterday, thanks to the gorgeous weather? I made this for my daughter’s 6th birthday party, and it turned out lovely. I have no idea how long I baked it for, but it was delicious. I did the four layer thing – the layers were easy to cut, and looked exactly like the photos.